i am happy this morning to feature a collection of songs from oil derek, AKA derek clatterbuck. he is a friend and a talented country/folk singer/songwriter and string player. his 'birdsongs EP' represents the first released recordings of a craft he has been developing for years. i was excited to hear them and i think you will be too. i already wrote about 'make-up call', the lead single from kentucky artist joplin rice's (the 1st artist on our very own practice records) new release 'hurricane alaska', so i won't belabor the point, but i will share with you the full stream now that it's out. it's good. i'm real into the opening track, 'console'. get it for FREE (or more) here. buy his last album 'low hum' on cassette for $5 from practice records? nueve is a home recording project from south bend, indiana. they have one of the best bandcamp descriptions ever seen: 'music you can disappoint your dad to'. the newest single is called 'i saw a spider'. it's scummy, nihilistic bedroom grunge with unexpected melodic guitar riffs. great lofi recording moves on display. it has been awhile since the release of old-time picker sam moss' excellent full-length 'no kingdom', but fourtunately he has just let go a new quickly made lofi EP to spell fans over until his next proper album. 'pitkin county morning' offers up a hand full of his new songs recorded simply with a spanish guitar (some fiddle on 'vertebrae') and his high, silvery voice. his intricate, melodic finger picking on the nylon strings shines in this intimate setting. 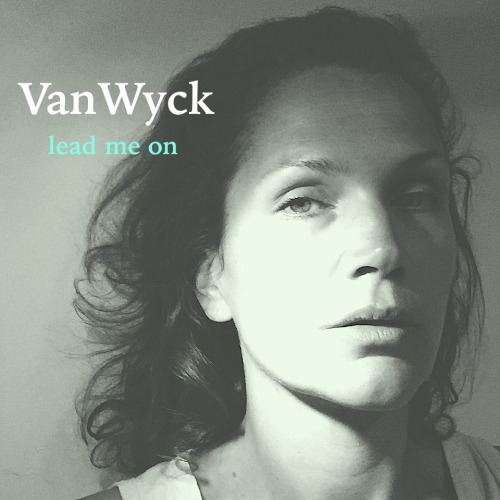 dutch folk singer van wyck began a song-a-week video project this past week, the first one is called 'lead me on'. it's a stark and understated folk song that rightly features her incredible voice with just enough lead guitar, percussion, bass and piano towards the end. the video shows her and her back-up players in the studio. i love videos that let the viewer in with an intimate feel on the musical process like that, and i imagine that most of the series will go that way. check out the rest of the series as they come out here. a new song each week. 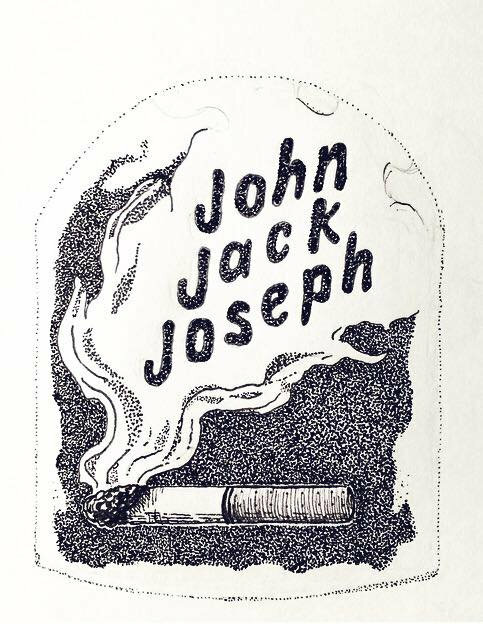 john jack joseph is a singer/songwriter from austin, texas. his debut album is called 'the electric life'. the songs within blend psychedelic garage rock production with folk and alt-country influenced songwriting. the studio band has an effortless looseness to their playing. reminiscent of the psychedelic folk rock of the late 60's with an added modern, noisy edge, i think this would be a great late night listen. 'the kinch service EP' by californian home recording project how scandanavian (AKA brian santizo) is a study in slacker rock with plenty of garage pop moves to keep you interested. the lengthy bandcamp description (maybe the longest bit of writing i've ever seen hanging out below an album on that site!) explains how this album took awhile to make, because brian had lost some of his interest and confidence in music making, but that through the process, he became re-inspired. i'm glad he did because the EP is great. reminiscent of the best of late 80's/early 90's noisy, underground rock. highly recommended. 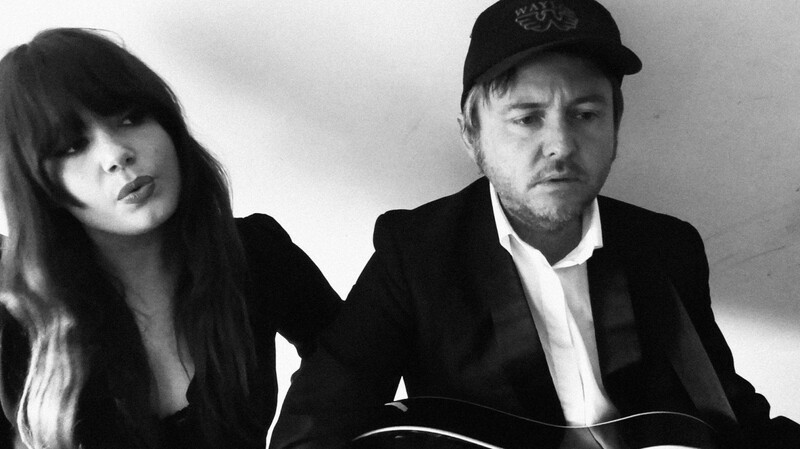 here is another video from across oceans...an upbeat but dark folk/pop tune called 'cut all ties' by australian duo jep and dep, from their album 'word got out'. it's a classic, moody black and white music video to accompany a strange, creepy story-song. the song starts with guitar strumming, some western tambourine slaps and the duo trading verses and choruses. it ends with soaring harmonies and a huge maximalist-pop crescendo. you can grab 'word got out' here. 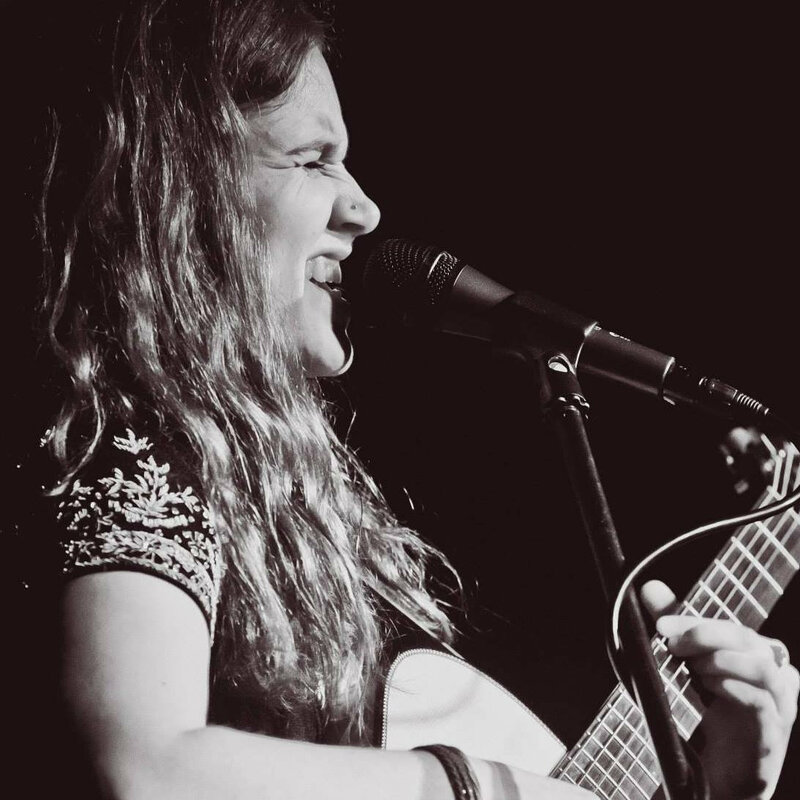 i'm always excited to hear new music from british singer/songwriter chloe march. 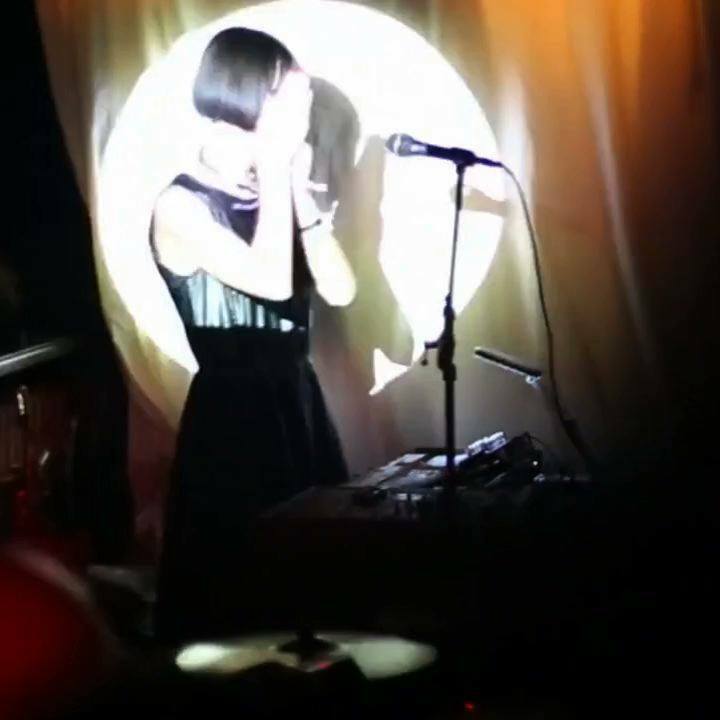 her musical approach stays unconventional, with dream-pop production that blends electronic and organic elements and vocal melodies that are jazz-like in their unexpected twists and turns. it's a bonus that the music she sends me is usually accompanied by equally dreamy visuals. her newest song 'may', from her EP 'under the day', is an understated piano-based piece that lets chloe's voice take center stage. it reminds me of a traditional jazz ballad approached at the pace of a sleepwalker...it's mesmerizing. you can get 'under the day' here from hidden shoal recordings. 'single step' is the debut album from san diego singer/songwriter emily ann laliotis. the album title is inspired by a quote from taoist philosopher lao tzu, 'a journey of a thousand miles begins with a single step'. that seems like an appropriate head space from which to approach one's initial foray into songwriting and recording. it's a solid introduction. emily relies on her voice and guitar playing skills, employing only minimal, tasteful touches of contemporary folk production, as well as some beautiful harmonies by her sisters (i am a huge sucker for siblings doing harmonies! ), to put flesh on the bones of her carefully written folk ballads. brightener is the stage name of california singer/songwriter will sturgeon. 'morning light' is the lead single from his forthcoming album 'hummingbird'. it's catchy folk/pop love song with a big chorus. the production is wide and breezy and matches with will's voice. feels like a summer (or early fall) driving song. find out more about brightener here. indytronics is a ukrainian band dealing with dance-ready, slightly gothic indie/rock grooves on their latest album 'scintilla wave'. indytronics seem ready for international exposure with their catchy, hook heavy songs and crisp production. the paranoid love song 'frightened dancers' stands out to me, with an excellent central riff, internal dynamics, and vocal melody. there is heavy guitar action all over the album, the way the guitarists interact with the rhythm section reminds me a bit of the arctic monkeys. you can get 'scintilla wave' from a variety of platforms here. 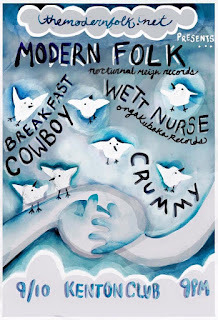 last week i put on the first ever modern folk music of america live event, a four band bill of rock'n'roll at north portland's world famous kenton club. it was a good time and i thank everyone that came out. for those of you who follow this spot but couldn't make it, i took some photos and videos to fill you in. and here we are (the modern folk) playing our newest, longest song, 'temptation of st. anthony jam'. i was pretty drunk at this point. i hope that a good time was had by all. i would like to do more of these in the future featuring more artists i have covered here and varying combinations of styles. check out some more videos from the show over at the MFOA youtube channel. 'land of plenty' by guitarists bill mackay & ryley walker is an album that grew organically, from living room jams to a weekly show at a bar into a carefully crafted live album. if you are following the burgeoning scene of instrumental guitar music inspired by the american primitive tradition, you might already know both these players, and you are probably already excited to hear the collaboration. you won't be disappointed. on the title track, provided as a preview, their guitars blend together like two silver mountain streams flowing into one another, riffing on a cascading theme that seems to blend celticisms with country blues vibes resulting in something that wouldn't sound out of place as a snippet of a grateful dead song. the dynamics in the tune put the musical communication between bill and ryley on display. harmonized notes practically gleam. highly recommended. this kind of music is by its nature usually performed solo, it is exciting to hear two players with such sensibilities collaborate. get it here from the whistler records. what can i say about virginia rock band dead professional that i haven't said over the several posts i have made about them? i have probably even written that same sentence before. but i can say that they are one of my favorite current bands and that isn't just because they are my friends; and that they have a new album called 'young hardware', due out september 25th. you can pre-order 'young hardware' here. fall break records is an athens, georgia based tape label that consistently releases some great, outside the box psych rock/pop, specifically from two bands i've really enjoyed, dj dingo suzi and attic fowler. they have two new releases out right now, one from bedroom pastiche-rock project richard gumby and one from post punk band dead neighbors. i'm gonna break them down for you below. richard gumby's 'hardrive' is a varied album, somewhat like going through the hard drive of someone's personal computer at warp speed, only being able to observe snatches of the volumes of various media contained there. the music alternates jarringly between uptempo, scuzzy power pop/punk tunes and spaced out psych rock, with a patchwork of sounds, field recordings and words in between that create an experience that is cohesive through being so fractured. get it here, cassette or digital (digital will cost you $666.66). dead neighbors represent a different side of the musical coin with their self titled tape, taking a lofi, no frills recording approach to their stripped down rock. it's direct, straight forward punk rock with a bit of a jangle blasted out in tight power trio style with a lofi haze stuck to everything. very good. get the cassette or the mp3s here. check out everything on fall break records! 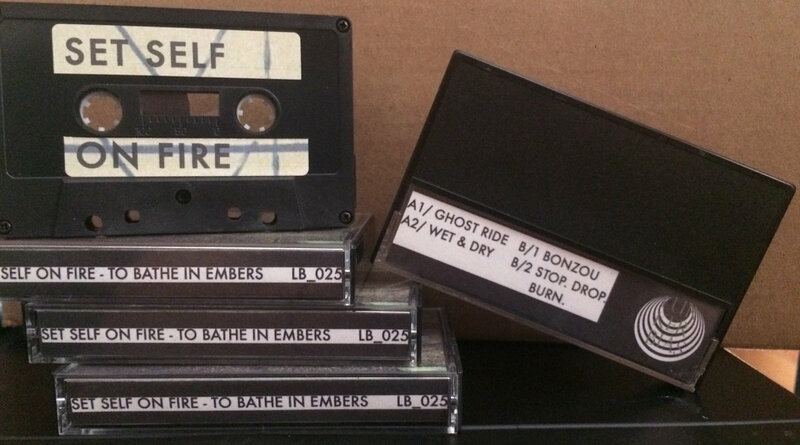 set self on fire is an experimental, four piece free-improv ensemble. on their album 'to bathe in embers', they make protest music in the great tradition of free jazz, reminding me a bit of the approach of fellow chicagoans the art ensemble of chicago. "The world is a mess. and what's worse is that to a certain extent society would have us be complacent of this fact. however, it is up to us that are aware to stand up and say something in protest against the madness. in that spirit set self on fire is the musical equivalent of self-immolation." get it here, digital or on a very nearly sold out hand dubbed cassette. ekstasis is an experimental 'devotional' folk band from one of my favorite cities, olympia, washington. their music is mystical in its sound and scope, blending the drama of celtic folk sounds with some progressive, psychedelic and new wave elements. pre-order the double LP or grab the CD or digital version here. 'vorfreunde' by pat moonchy is intensely personal noise music. it combines electronic elements and field recordings with the ultimate organic instrument, the human voice. pat uses her voice in an amazing, raw way. she intones grunts, moans, chants and mantras that can captivate and disturb. she employs the textures, the hisses, clicks and gurgles of the recorded voice, in a musical way as well. i bet this is something else to experience live. 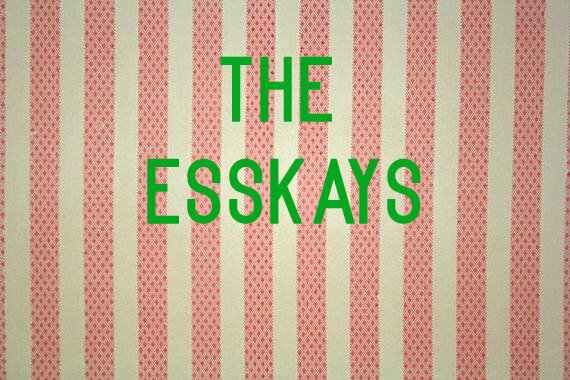 the esskays are a garage/folk/rock band from nashville, tennessee. their latest album is called 'the moving out sessions', a pleasantly rustic swansong made up of the final demos and outtakes made at their old recording space. the album is full of rural, spaced out stoner-folk jams recorded with a friendly lofi warmth. joyful harmonized vocals stand out. one of those albums that proves the point 'the demo is the record'. tony dutcher is a lofi/bedroom rocker from portland, oregon. on his latest album 'frustration station' he works in the classic mode of huge hooks embedded in loud-soft-loud dynamics and thick slabs of big muff fuzz. reminders of all the best heavy rock from the 90's. i recommend the track 'all is falling', which has some additional female vocals and a shoegaze sensibility. 'messenger of wonder' by the diamond center is a pitch-perfect psych rock jam. a full blast of organ, gauzy vocals and twisted, acidic, buzzing guitar leads. it's the lead single from the richmond, virginia band's new record 'crystals for the brass empire', which is out soon on funny/not funny records. riffs and reverb for days. pre-order 'crystals for the brass empire' here. 'last known photograph of jackson emmer', by jackson emmer, is a folk/rock album made with friends in the family basement in the mountains of colorado. 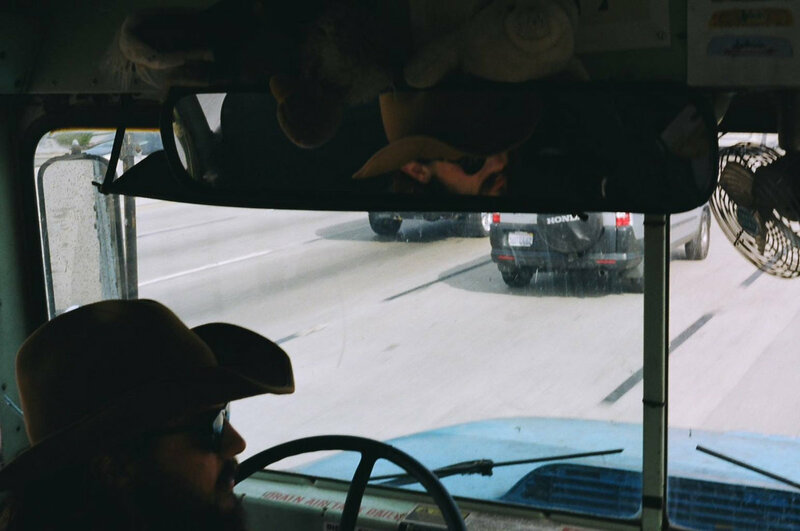 it sounds like a mix of traditional country music and the kind of heartland rock songwriting exemplified by bruce springsteen and tom petty. there is warmth and cohesion in the music that lets you hear the closeness between the musicians and the fun they had making the album. songs like 'score', with its e-piano, dark themes, and moody riffs, stand out among the general alt-country feel of the album, and show that jackson and his friends have a variety of moves up their sleeves. no surprise that excellent old-time string player sam moss was a session man on this album! 'junk-E garage' is the latest 7" release by italian folk/rock/lofi band thomas guiducci & the b-folk guys. it's some tom waits-damaged garage skronk, full of jagged guitars, wailing harmonicas, distorted vocals and pounding drums. the vibes are ominous. the performance hangs in the balance between loose and tight, the way you want music to. get it here, 7" or digital. cody pennington is a nashville based singer/songwriter. his newest tune is called 'love love', an emotional song about love in all forms, both romantic and the kind of general love for humanity that could make the world a better place. the song is tastefully produced with contemporary folk touches and some nice fiddle playing. cody puts his money where his mouth is in the video, walking the streets of nashville and spreading the love by giving hugs to strangers. check out more from cody here. current swell is a laid back folk/funk band from canada who works it out on the festival circuit. their new song 'young and able' is a love tune in the form of a groove-folk jam. the video shows the pacific northwest version of a classic surfing beach bonfire party, which couldn't be a better fit for the vibe of this song. probably goes well with ripping the waves, and the joints. check out more from current swell here.